Line a square brownie tin with greaseproof paper. In a clean, dry bowl whisk eggs, sugars and salt until they become really voluminous and pale. This will take about 5 minutes. Scoop out the sweet potato from their skins and mash with a fork. Fold in the chocolate, ground almonds, chestnuts flour, coco powder, baking powder and vanilla extract until its incorporated. Add the Turkish delight. 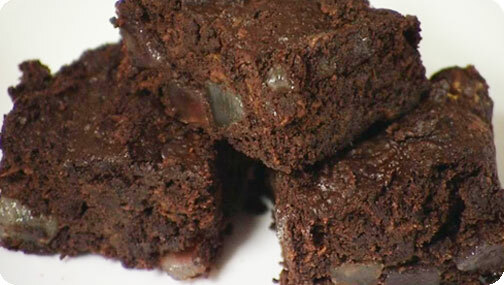 Pour into the lined brownie tin and bake for 35 minutes or until the top is firm.